Back in 1982, our dear leade r Margaret Thatcher was in deadly trouble. She was considered to be a harsh and grating shopkeeper with a vicious streak, who was heading for oblivion at the next election. Then some nasty little fascist nutter called General Galtieri in Argentina decided – also for reasons of electoral unpopularity – to invade the Falkland Islands, to which his country had a claim. Like everybody’s claim to the islands it was legally dubious, and could only ever hope to be settled through legal processes. Neither Galtieri nor Thatcher were interested in such nonsense, obviously – they were politicians. There was kudos, and votes, to be won. Much to the astonishment of the British – who had, however, just removed their naval presence from the area – the Argentinians were serious. They sent a small but determined force across the water, and quickly captured the place. Much to the astonishment of the world, and her own advisers, Maggie sent a task force 8,000 miles to get them back. Militarily, it was as near insane as makes no odds. To put it at its bleakest, if one of Argentina’s submarines had sunk the ocean liner Canberra that was carrying our troops (we had no troop ships, naturally – SO expensive!) the fallout would have been beyond belief. In the event, in the weeks of fighting, many soldiers and sailors were killed and maimed. More than nine hundred from both countries. Borges said: ‘It was like two bald men fighting over a comb.’ And now the islands are still British, although Maggie never held the promised referendum, and now Argentina is making belligerent noises once more, because the legal issues are still unresolved. Progress, eh? I wrote a play about it at the time. A three part serial for Thames TV, which they decided would be best placed in their schools programming. 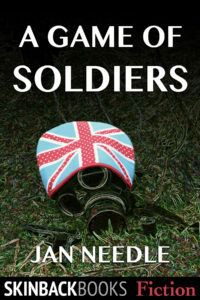 It was called A Game of Soldiers, and the Government were horrified. It told the story of three Falklands kids who find a badly injured young Argentine conscript hiding in a sheep shelter and decide to kill him. Not because they are evil nasty little beasts, but because of the reason the task force went all those miles – it was a patriotic duty. One wonders if broadcasters would have been able to resist similar pressure these days. Unhappily, I quite seriously doubt it. There won’t be another Falklands war anyway – both countries have run their navies down to the point where it could be neither fought, nor defended. Eightthousand miles is a hell of a long way to row. 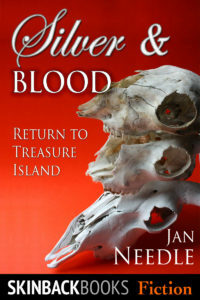 My other most recent offering through Skinback is Silver and Blood, my modern take on Stevenson’s miraculous Treasure Island, which clashed most egregiously with Sir Andrew Motion’s sequel, called just Silver. I haven’t read his yet, but I’m getting great feedback on mine. It’s a reimagining of the story for the 21st century, without parrots, wooden legs, and upper-class good guys pitched against the lowlife scum. Stevenson was shining a light on the accepted moralities of his time, and inviting people to work out what was really going on. Is Doctor Livesey, a Scot, really that much of a hero, for example? He boasts that he served with Butcher Cumberland,for instance – and Cumberland was known then as the brutal scourge of Scots. And Squire Trelawney, a pillar of his community, chose to search for stolen treasure that he had no right to, with a ship and crew that an honest man would have run a mile from. Many of the people in my version are also pretty ‘challenging’ from a moral point of view. And like Stevenson, I like a bit of blood and guts. Throw away the flintlocks – try an AK47! Silver and Blood available here. All Skinback Books are here.